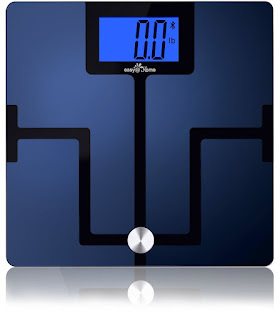 This Easy@Home Body Fat Scale can measure your weight, body fat, body water, body muscle and bone mass in a few seconds. I'm a huge fan of technology and a total numbers geek so this Easy@Home Bluetooth Body Fat Digital Scale is right up my alley. I absolutely love that this scale is blue tooth and all I have to do is step on it to get my weight, body fat, body water, body muscle and bone mass loaded into my phone. Here's where the geek in me comes alive! I love the graph display option! There's nothing like seeing data on a graph to make information easy to read and understand. I often weigh myself in the morning and before this Easy@Home Bluetooth Body Fat Digital Scale I'd often forget what my weight was with the hustle and bustle of everything going on in the morning. This is perfect for tracking your weight and certainly one of the easiest methods I've ever seen!